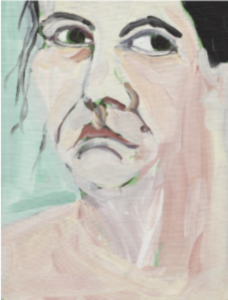 Please join us for a talk with acclaimed British artist Chantal Joffe in conjunction with a new exhibition of her work at Victoria Miro. The Mayfair gallery will be presenting self-portraits from a series started in 2018. On New Year’s Day, 2018, the artist set herself the challenge of working on a new self-portrait every day for the coming year. This daily practice has resulted in a series of characteristically unflinching works. Similar, but infinitely various, these works offer a rich alternative to self-portraiture’s idea of essential truth. After the talk, we will head to Hauser & Wirth’s nearby gallery for a presentation of the works of Romanian artist Geta Brătescu “The Power of the Line.” The exhibition features an important body of works from the past decade, during which time the artist focused predominantly on the line as a structuring principle. Brătescu, who recently passed away at the age of 92, was a pioneering artist working in the shadows under the Communist regime who gained much-deserved recognition in recent years, representing Roumania at the 2017 Venice Biennale.